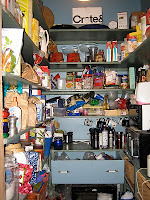 So, the one part of our house that began this organizational streak was our pantry. It drove me nuts, not only because it was messy and overwhelming, but because we were constantly losing food, which is a huge waste of time, money, and emotional energy. Even before I started the Cure, it was top on my list of things that simply had to be put in order. It's also the room that took the longest. I started this over two months ago — Patrick and I devoted a full night to it, and didn't get through it, and then finally finished the rest in a grueling effort last night. So this shot is especially gratifying because it shows a pantry in use, not just-finished and all clean and shiny. The paint could use some touch-up, and there are some holes in the wallboard (and I have to either fish or cut bait on the corkboard), but in general I am thrilled. Neither of these rooms were on my original Cure plans, but after seeing what people were doing, I got inspired. I've always wanted some fun Etsy prints for Beatrix's room, but I get overwhelmed, and truth be told we know so many artists that I could not justify buying anything over the internet. But then someone told me about Feed Your Soul, which publishes free downloadable art every week. I got some cheap frames from Ikea, and hung these above Beatrix's crib, with the idea that I could swap them out on a regular basis. She loves them! 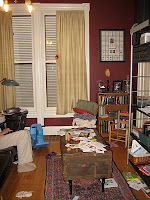 That also inspired Patrick to hang her lamp, which we had tried to hang before but needed a stronger ceiling hook. In the living room, I was inspired by finding this great platform rocker up for grabs outside the Northern Warehouse. We spent a long time gluing the joints and cleaning it up. Truth be told, it's still not as comfortable as I would like, but it's better than the ratty chair that was there, and I love the color. It's almost time for Open Eye Figure Theatre's Driveway Tour again! We'll be hosting the FIRST performance this year of The Adventures of Katie Tomatie, a great puppet show for families. The show is completely free of charge (though we'll be passing the hat afterwards.) It lasts about 30 minutes, and we'll provide refreshments afterwards. Won't you join us? In the middle of this domestic binge is a lot of good food! I'm testing recipes for a friends cookbook, and this chapter is "Big Batches." So yesterday I made a sweet potato-hominy chili, and vegetarian tamale pie, both in big freezable batches. While not exactly gourmet, they are both good dishes that I am pretty happy with. Then tonight I made a batch of lilac cocktail syrup, basically simple syrup infused with fresh lilac blooms. It's part of my quest for the perfect summer cocktail, and I hope it tastes as good as it looks! If not though, I've found the perfect summer cocktail: lemonade, vodka, and elderflower liquer. It's a drink invented at my friend Rebecca's on Saturday night, at a cheese tasting, tres leches cake eating, fire gazing cocktail party that was a truly wonderful evening. The best? A coffee-lavender hard cheese. Mmmmmm. We gardened the h*ll out of the weekend. Friday was a beautiful day, and my mind was full of numbers by mid afternoon, so I just started in on a little weeding in the pretty overgrown front yard. Well, it became one of those things that you just can't stop, and by the end of the weekend we had weeded through the entire front yard, including two badly overgrown beds that I had not really touched since Beatrix was born. It was a lot of work, but totally worth it. Beatrix loved being outside with us and carrying the weeds back and forth from pile to pile. She also loves to water the plants; I'll have to look into getting her her own watering can, because our usual one is as big as she is! As might be expected, I have lost some plants I know were there at one point, including (sadly enough) some beautiful mums planted years ago by my friend Scott. So even though I pretty much failed the Apartment Therapy Cure, I still got several things done that I am proud of. Our den was in pretty good shape, but a little messy. A few organizational items, like another baskets for Beatrix's books, helped a lot. I also switched out some picture frames, which likewise helped. One of the projects in the Cure was to establish "landing strips" so that things did not just get dumped by the door. I was pretty dubious, because I know how we operate, and we tend to do things like read our mail at the dining room table. You know what? Today sucked. I had a long, emotional phone call. I have an unidentified issue with my new computer that may not be warranty covered. I need about a billion dollars of work done on the Summit house. I'm incredibly behind on work (see above note re: computer). The house is a mess. It was blustery and cold. I didn't get a chance to call someone back that I needed to. I have officially failed the Apartment Therapy Cure. I accrued a library fine on a design book. Beatrix has been restless and neither of us have slept at night in days. I'm sick as a dog. Tomorrow has GOT to be better, right? Though we have dragged Beatrix everywhere since she was a baby, one of the big delights of her current age is that she is actually participating in the things we do. This weekend, for example, we went to the Circus Juventas performances on Saturday night. Though up past her bedtime and tired, Beatrix loved watching the kids perform (especially since the show starts with the toddlers and her friend Max was one of them.) She clapped a lot, and also loved climbing up on her chair and sliding off. Sunday we went to Heart of the Beast's annual May Day parade and festival. Well, actually naptime precluded the parade, but we made it to the crowded hill to watch must of the pageant. Again, Beatrix was all about the experience, especially people-watching and dog-counting. This week's activities will be more mundane, but she'll get to see lots of people she likes and she got Dairy Queen last night, so I think she'll be ok. So, despite my "Great Nights Out," not every place we go turns out to be absolutely perfect. I mention these two places below exactly because of that — they were perfectly good places, that were enjoyable enough, but did not *quite* live up to my expectations. I would encourage people to go to them (or places like them, places that are ok but could do better) in order to support local businesses and help them grow. I know in both these cases I'll definitely go back.